It’s that time again; spring break is here (albeit a short one!) and your kids are just itching for something to do! Some of their friends have left town, some are busy with a spring break camp o an after school program, and your suggestion of spring cleaning is met with a less than enthusiastic response. What is a parent to do? Fortunately, the Maryland/DC area is brimming with activities that will appeal to a wide range of ages and interests. Want to go higher? How about a hot air balloon ride over Frederick? Most rides occur in the early morning hours, which might require an adjustment in your child’s schedule, but it is said to be well worth it. Some sunset rides may be available. Check out https://tailwindsoverfrederick.com for more information. We hope you take advantage of the many wonderful things to see and do in your own backyard. You might want to reconnect with some Green Acres Camp friends and spend some time playing games or crafting while revisiting memories from last summer! It is mid-September and we have all had a few weeks to adjust from our summer mode to our school and work routines. Some of us have embraced the change willingly, while others of us have dragged our feet, holding onto the last days of a more leisurely schedule. If you fall into the latter category, autumn might be a time of struggle, and it may require extra effort to greet the day with a positive attitude. Your children might be wrestling with the same difficulties. There are some strategies available that may help you and your children to have a more positive outlook on life. Morning affirmations are one way to begin the day. There are a variety of methods to accomplish this, but the goal is to make oral statements that you and your child believe are true. For example, “I am a kind and honest person”, “I can run really fast”, or “I love singing in the car on the way to school”. These affirmations can be written as well. You may want to post them in locations where you will see them, such as on the bathroom mirror, the kitchen table or the door. Taking a few minutes each morning to focus on positive thoughts can set the tone for the rest of the day. Taking a breath before reacting to something negative, and giving your mind a chance to decide how to respond can help determine your mood. Give yourself the opportunity to direct your thoughts. Rather than becoming angry at someone’s rude statement, stop and decide to not allow that person to control your emotions. You can model this for your child when something that could cause a negative reaction occurs, but you consciously choose to respond differently. For example, you burn the toast that you are making for breakfast. Typically you might yell, throw something, or even curse. In reality, is it that big of a deal? Take a breath and let it go. It’s a piece of toast. You might voice your frustration about burning it, but you can do it without anger. You can help your child do the same by talking through it with him/her. Help your child realize that annoying situations are just an irritation, but can be looked at in a more positive manner. It’s not always easy and requires a conscious effort. During camp counselors strive to be positive role models for kids and to make their camp experiences positive ones each day. Let’s keep it going throughout the school year! Friendship, Fun, Creativity, and Choices! These are the four key words that constitute the philosophy of Green Acres Camp. On any given day, if you wander through the campus, you will find campers participating in a wide variety of activities. Campers have an opportunity to choose their workshops and afternoon activities. Summer Strummers (ukulele), Drones, Kitchen Chemistry, and Sports are just a few of the choices in Senior Camp. All junior campers take the five specials (music, art, woodworking, science, and sports) and then choose afternoon activities such as Rush and Dodge, Scavenger Hunt, Cooking, and Face Painting! If you have had the opportunity to visit on Parents’ Day, you were able to observe your child involved in decision making. If you were not able to make it, please check us out on Facebook to see photographs and slideshows of our campers in action! Making choices is a skill that needs to be developed over time. Young children can choose which clothing they want to wear for the day, or items to include in their lunch. As they grow older, the choices become more detailed or sophisticated. Children may have input on vacation ideas or academic course choices in school. It is important to continue giving children choices as they grow so that they are accustomed to making independent decisions, rather than relying on peer pressure or an adult to decide for them. For more information, you may want to read “5 Guidelines for Giving Kids Choices” by Erin Leyba LCSW, Ph.D. If you have an older child, you may find this article useful. Green Acres provides a safe environment for campers to make a choice, take a risk, and try something new. They know they will be supported by caring counselors who will encourage them to make decisions which may be different from those of their friends. It is our goal to help develop happy, confident, and independent individuals who are simultaneously having wonderful experiences at camp. The second week of camp was full of such excitement it seemed to go by in a flash! Extra special activities included the “Fun Run”, where all participants felt a sense of accomplishment as they crossed the finish line and received their medals, our patriotic fourth of July parade, which was enjoyed by all of the units as they marched through the camp and waved to the many cheering parents, and the afternoon Indian dance assembly! Senior Camp competed in a giant game of Capture the Flag, and the GAC Cup, through which they learned answers to questions about many of the counselors. All of this was in addition to the daily specials, workshops, swimming, and activities! This week, campers also learned more about one another and their counselors. They discovered who tells funny jokes, who can play the ukulele, and who is a great dancer. There were unit cheers and songs, and campers shared what they have in common with other campers. Friendships began to bloom. One of the key words of Green Acres Camp is friendship, and counselors provide many opportunities for campers to learn how to make friends. Understanding how to share, learning how to have more than one friend, and developing trust are all skills that campers glean from daily experiences with their peers. Parents also play a role in helping their child to nurture friendships. You may be interested in reading this article by Lena Aburdene Derhally, psychoanalyst and author of The Importance of Childhood Friendships and How to Nurture Them, which provides several suggestions for parents to help their children develop warm and positive friendships. We are all familiar with the song lyrics, “Make new friends, but keep the old, one is silver and the other’s gold”. We hope your child is talking about new friends that he/she has made at camp, and we encourage you to support them. We have to come to the end of our first fabulous week of camp. 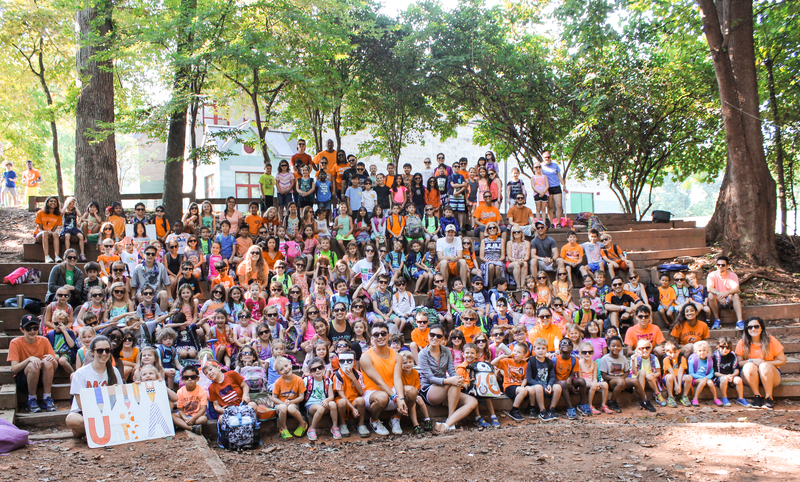 Laughter, gasps, and shrieks of delight have filled the air as campers have reunited with old friends, tried new activities, and marveled at the magic of John Hadfield, the star of our science assembly. Green Acres Camp has always been a special place, where campers are the central focus. Each year staff comes together to brainstorm how to make the camp even better than the previous year, and the summer of 2018 is no exception. We have added exciting opportunities for campers in both junior and senior camp, such as Bee Bots, Drones, and playing the Yukulele! As you check out our newsletters, you will find photographs of campers in each unit involved in all types of workshops. Use the pictures as a springboard to ask your child about his/her experiences this week at camp! One of the goals at Green Acres is to encourage campers to try something new. This might be taking a risk to make a new friend, trying an activity that they have never tried before, or choosing to go to a workshop without a best buddy. Each camper develops at his/her own rate and receives support and encouragement from the counselors at each step. New experiences are celebrated and the campers feel a sense of accomplishment when they try something that forces them out of their comfort zone. We encourage you as parents to support your children as they develop these skills. In the article “Risk-Taking Can Lead to Growth” by Kristine Snow Millard, the author stresses the importance of taking risks. “It’s all about connection, all about relationships,” she said. “Being able to say, ‘that was awesome, you tried that, and you learned a lot, now you know what you can do differently,’” is a key to a counselor working with a camper, McMullan said. We hope this week is just the beginning of an incredible summer filled with choices, creativity, friendship, and fun! It’s May, and whether you are new to Green Acres camp or already part of our family, it’s time to prepare for the fun and excitement that awaits your camper this summer. Knowing what to expect will make the transition from school to camp a smooth one, and will enhance your child’s camp experience. We can’t wait to meet everyone! Clothing: Camp is not the time to sport spanking new clothes, unless dirt, paint, and grass stains are your friends. Kids should feel free to take risks and try new activities, not worry about whether mom will get upset about stains. If you insist on purchasing new clothing, consider a rashguard to help prevent sunburn, an extra swimsuit, or a hat to wear on those sunny days. Please make sure you label your child’s belongings to help us keep belongings with their rightful owners. Footwear: Your child will be very active throughout the day, and it is important that he/she wears comfortable shoes. Although sandals are cute, sneakers are the best choice as they will protect your child’s feet from scrapes, cuts, and uneven surfaces. Slip on shoes can be used to walk to and from the pool. Sunscreen: Campers spend time both in and out of doors, and it is important for their skin to be protected from the sun’s harmful rays. Please make sure you apply sunscreen before camp, and send sunscreen with your child to camp for application after swimming. There are many opinions about the safest type of sunscreen for your child. Read about some ideas at the following website: http://www.livestrong.com/slideshow/1005303-30-safest-sunscreens-3-avoid/#slide=35. Students should also invest in a pair of goggles for swim lessons. Make sure you label them with a permanent marker. The most important ingredient to pack is a positive attitude and sense of humor. Camp is an exciting experience that offers campers the opportunity to be creative, make choices, build friendships, and, of course, have fun! Encourage your child to be open to new friends, and to be kind to each other and the earth. Green Acres Camp; it’s the place to be! February; the last month of winter and the month following January. January was fun. We had the chance to celebrate the New Year and greet the world with a clean slate. It was the time when many of us made a resolution. Well, how are you doing with that resolution? Is it time to restart, or is it time to make a new one? February is the shortest month, and unfortunately, a month that is often filled with gray and dreary days. Sometimes we are greeted with snowstorms, and other times, just boring, bone chilling cold. So when there is no snow in which to play, what can you do to make February a happier month? You may not realize that in addition to Ground Hog Day and Valentine’s Day, February holds many titles, such as National Wild Bird Feeding month, National Grapefruit Month, and National Snack Food Month. For some ideas on how to celebrate, you may want to visit https://www.thespruce.com/family-activities-to-enjoy-in-february-4134466. Often the food we eat influences our response to the dreary weather. Munching on greens, citrus, and even chocolate can help to boost our attitude. Check out “15 Foods to Cure the Winter Blues” at https://www.livestrong.com/slideshow/1009407-15-foods-cure-winter-blues/ to learn what you can do to turn your boost your attitude. Making crafts with your children can be a fun way to spread cheer. You can find 150 recipes, games, art projects, and, of course, valentines at https://www.pinterest.com/weekday3s/february-crafts-and-activities/?lp=true . Your kids will love creating something special with you. You may want to get away from it all and visit some attractions close to home. Maryland offers many things to do, even in the month of February. Check out https://www.tripadvisor.com/Attractions-g28941-Activities-Maryland.html for all sorts of ideas. We hope that you had the opportunity to celebrate Green Acres Camp at our “Summer in the Snow” event in January. February brings us one month closer to the beginning of camp for another season of fun. Find some ways to beat the February blues and before you know it, we’ll be wishing for a brief blast of winter chill as we melt in 90 degree summer heat! Green Acres Camp; it’s the place to be! As the temperatures drop below freezing, and we bask in the warmth of our homes, it is a good time to reflect on the year 2017. Most of us have recently celebrated the holidays with family and friends. Perhaps a special meal or gifts have been shared, and we are looking forward to the New Year. How will 2018 be different? Have you made a New Year’s resolution or plans for a better year? Have there been situations that you are trying to put behind you in order to move forward? No matter what your goals are for the future, it is important to focus on the positive. The manner in which you greet each day and react to your environment will determine how your day progresses. A positive attitude not only affects you, but those around you. Something as simple as a genuine smile and a warm greeting creates a domino effect that can be contagious. If negativity is thrust upon you in a social situation, a work conflict, or even a family interaction, the manner in which you view it will determine the direction it will continue. Before you react, take a breath. How might your actions be positive, even in the face of adversity? It’s not always easy to stop ourselves from responding in an equally negative manner, but those few moments of determining that you will be positive can make all of the difference. If you have been exhibiting a negative attitude and expecting failure and difficulties, it is now the time to change the way you think. It is the time to get rid of negative thoughts and behavior, and start leading a happier and more successful life. If you tried to do so in the past and failed, it only means that you have not tried enough. Look at the bright side of life. It's a matter of choice and repeated attempts. Find reasons to smile more often. You can find such reasons, if you search for them. Have faith in yourself, and believe that the Universe can help you. Visualize only what you want to happen, not what you don't want. One of my most positive experiences of 2017 is, of course, Green Acres Camp. Please be sure to join us on January 6 for our annual, “Summer in the Snow” celebration where you are invited to share a taste of what camp has to offer your child. We look forward to seeing you then! Green Acres Camp: it’s the place to be!